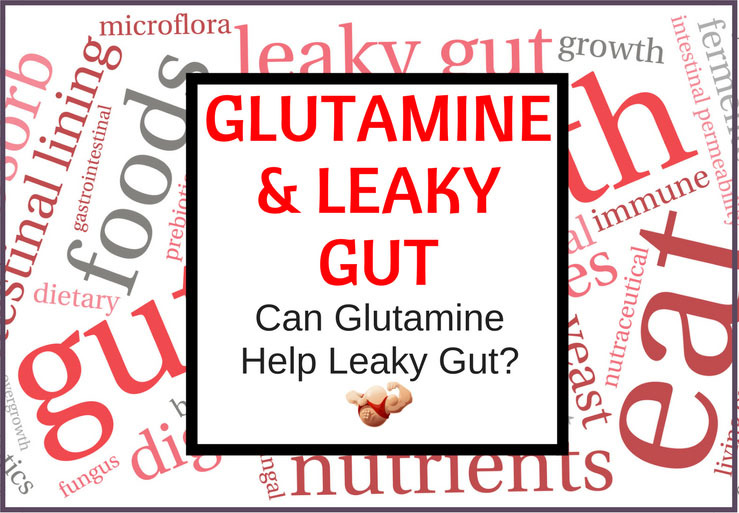 L Glutamine & Leaky Gut: Can Glutamine Really Help Leaky Gut Issues? Glutamine is an amino acid found naturally within the body. In fact, it’s the most common amino acid. Amino acids have a fundamental role in cell structure, organ function and the transport of nutrients. Glutamine has a variety of health benefits, including helping a leaky gut. So, how does glutamine aid the gut and what are the benefits of supplementation? Glutamine is also known as L-Glutamine and is mainly synthesized in the muscles. While it’s a non-essential amino acid, its conditionally essential when the body is suffering from illness, injury or a period of stress. How Does Glutamine Help The Gut? A study on glutamine revealed that this amino acid maintains the function of the gut. The cells in the lining of the gut directly absorb glutamine to promote a healthy environment as their size is small and their chemical structures allows them to be transported around the body without a carrier molecule. Furthermore, glutamine boosts the gut's ability to perform at optimum level, as well as eliminating toxins. Those with a leaky gut suffer from toxins and large particles being able to enter the bloodstream. Glutamine enhances the barrier function, thus, preventing substances entering the bloodstream to cause inflammation and adverse metabolic effects in the body. Scientists have suggested that leaky gut is linked to many health concerns, including irritable bowel disease, type 1 diabetes and celiac disease. Glutamine is one of 20 naturally occurring proteins found in dietary protein.3 High levels of glutamine are found in meats, fish, eggs, nuts, beans, spinach, and red cabbage. While you can obtain added amounts of glutamine from a balanced diet, other factors may cause a problem. Scientists working at the University of Dijon have indicated that sugars, fats and other compounds found in food during the cooking and processing stages can cause degradation of junctions in the gut, resulting in the leakage of toxins into the bloodstream. This could cause problems for those relying on diet for their consumption of glutamine. Furthermore, heat destroys glutamine, so unless you’re consuming many raw foods rich in glutamine, supplementation is the solution. Glutamine is available as a supplement in both powder and tablet form. Both methods offer pros and cons, so the right supplement for you will depend on your preferences. Glutamine tablets provide a convenient method of consuming this important amino acid. You can take tablets whenever you need them and they’re ideal for consuming on the go. However, depending on the dosage, you may need to consume more than one pill. On the other hand, if you’re intending to consume larger quantities, glutamine powder is better. Powder is available in larger quantities, offering better value for money. It’s also easy to digest and is perfect for those who struggle to swallow tablets. According to an article published in The Austin Chronicle, 2004, glutamine is best taken on an empty stomach when being used for reasons other than bodybuilding. This is due to potentially less of the supplement being required and it may be tolerated better by the body. However, if you find it difficult to consume supplements on an empty stomach, taking glutamine with food is the best option. The correct dosage depends on your personal preferences. However, doses for leaky gut normally vary between 5g and 20g daily. If you’re new to glutamine supplementation, its best to start with a small dose first and work up to a higher dosage over a number of weeks. Consult a doctor before starting any supplement. How long it takes to heal the gut depends on varying factors. Aspects that should be taken into account are the diet – if you suffer from a leaky gut, spicy food, alcohol, coffee should be avoided and a healthy, balanced diet should be consumed. You also need to consider your dosage – smaller doses will likely take longer to have an impact. Like many supplements, glutamine has side effects that need to be considered. However, side effects tend to be rare. Glutamine is not recommended for pregnant or breastfeeding women. Furthermore, those with liver damage and cirrhosis should avoid glutamine supplementation. Gelatin/collagen supplem﻿﻿﻿ents are also highly recommended for those with a leaky gut. Collagen is a protein found naturally in the body. While its commonly known for skin benefits, it also aids a leaky gut. Gelatin is a substance that stems from collagen, but they both offer the same benefits. Collagen helps to tighten the digestive tract and aids cell growth. This helps to repair damage in the gut by preventing harmful toxins from entering the bloodstream. If you suffer from a leaky gut, it’s important to find a doctor who recognizes the healing process. A leaky gut can have many other symptoms so it’s essential to gain advice from a qualified healthcare professional. If you’re planning on supplementing your diet with glutamine, start with a low dose to assess if you have any side effects. Once you’ve started supplementing with no adverse reactions, slowly increase your dose to assess your tolerance. It’s very important to choose a quality product. A high-quality glutamine supplement will help you obtain your required dosage and only use pure ingredients. 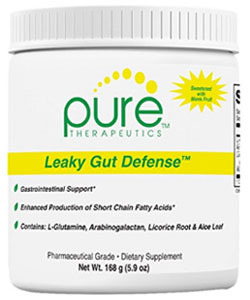 Pure Therapeutics Leaky Gut Defence is a 168g of powder supplement that is perfect for those new to glutamine supplementation. Each tub contains 30 servings and is formulated with l-glutamine, aloe leaf and licorice root to help heal the gut. This supplement is stevia free and has a 100% money back guarantee. Manufactured in a GMP certified facility, the custom formula should be taken one to three times daily. Each dose contains 3g of glutamine. Simply mix one scoop of powder with 2-4 ounces of water and consume. Easy to swallow and great value for money, there are no artificial colors or preservatives.